The subject term Communications should be used with descriptions that relate to communication professionals and activities including, but not limited to, journalists, broadcasters, documentary film makers, commercial photographers, newspapers magazines, newsletters, radio , television, telephone, cable, documentary film, internet, advertising, printing, publishing, journalism, symbols, logos, flags and communication based professional organizations. 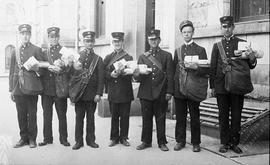 Item is a photograph of seven postmen in Sherbrooke, dressed in uniform and holding mail and parcels (possibly Sherbrooke's first postmen) from around the 1910s. 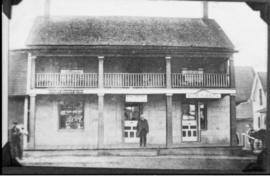 Post Office and Customs - Bureau de poste et la douane, Richmond, Que. The item is a postcard showing the post office in Richmond around the 1930s. La pièce est une photographie de Fernande Bourrassa travaillant comme téléphoniste pour Bell Telephone à Waterville vers les années 1940. Eastern Townships Bank and Post Office, Coaticook, Que. Bureau de Poste, Post Office, Coaticook, Que. L'ancien bureau de poste de Coaticook, coin des rues Main Est et Cutting.